I hope those of you who are lucky enough to have the day off did something fun. For today's Makeover Monday post I wanted to share with you our front porch design. Erik and I bought a house that had been previously owned and are slowly making it our own. While we were saving up for a house we had a lot of time to daydream about how we would like it to look. This is what we came up with for the front porch. On the left is the color we would like to paint the front door. Then we have a black handle that we think would really pop against the door and match the black porch light shown on the right. Update our street address with some satin numbers and flip them vertically. 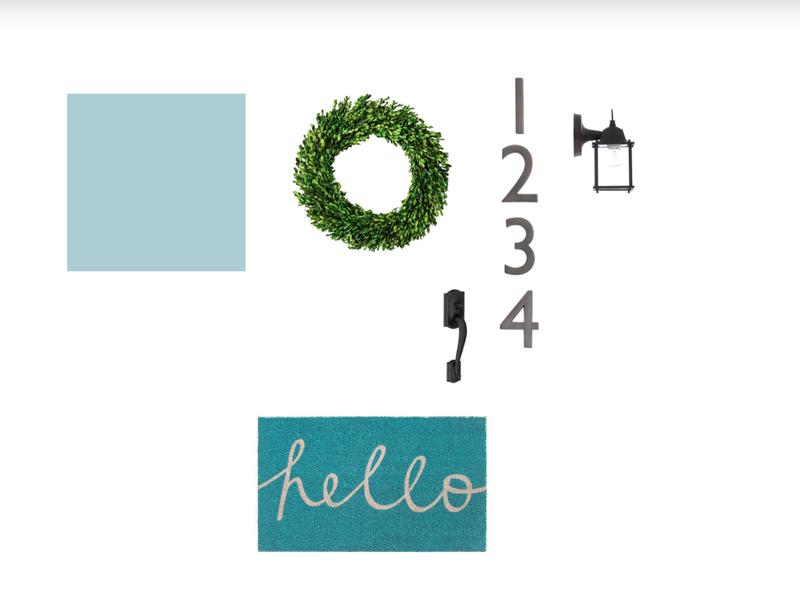 Add in a fun wreath and cute door mat for decoration and there you go! The decorations will change with the seasons but this is what we liked for our basic look. I am so excited to start decorating for fall!